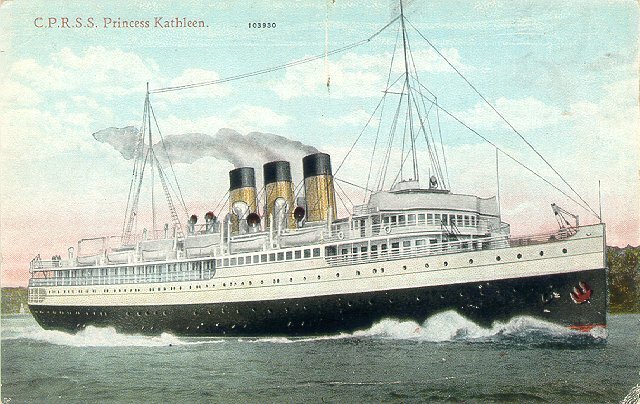 Built by John Brown & Co., Glasgow, Princess Kathleen was launched in 1924. Her maiden voyage was from Glasgow to Vancouver via Panama. From there she entered the Vancouver-Victoria-Seattle coastal service for which she was built. Taken over as a troop transport in September 1939, she returned to Canadian Pacific in 1947 and resumed service on her old route. Two years later, she was transferred to Canadian Pacific's Vancouver-Alaska cruise service. On 7 September 1952, north of Juneau, she went aground at low tide. When the tide rose, the bow remained aground while the stern was swamped. She then slid into deep water as the tide rose further and was a total loss. There were, however, no fatalities.